Rockabilly & RnR special ft. The Blasting Caps, The Obscuritones + more..
Watch out – this line-up is scorching hot!!! 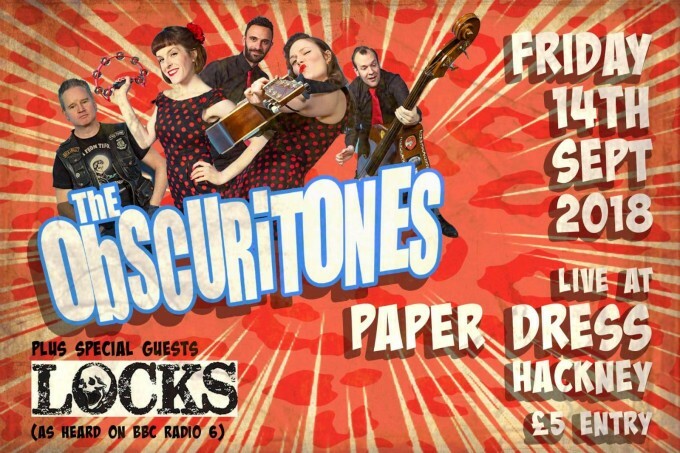 A headline set from dynamite Jump Blues & RnR dons The Blasting Caps, high tempo Rockabilly from The Obscuritones, dark blues merchants LOCKS + the powerhouse funk of Concrete Natives to get the party started! Dynamite Jump Blues / Rock & Roll Band! Close harmony and rockin rhythm. Like the Andrews Sisters singin with the Stray Cats after a night out with the Cramps!!! Featuring live on stage.. Incorporating a blend of soul, rock’n’roll and the blues with contemporary influences coupled with an electric live performance, they deliver a fresh take on the classic New York funk sound.